A public research university located in Albuquerque, New Mexico. It is the state's flagship research institution. Founded in 1889 and commissioned by the Legislative Assembly of the Territory of New Mexico, the first president was Elias S. Stover. UNM offers bachelor's, master's, doctoral, and professional degree programs in many disciplines. In addition to the North and South Campus locations, found in the center of Albuquerque, there are five branch campuses associated with the university, with locations in Rio Rancho, Gallup, Los Alamos, Taos, and Los Lunas. 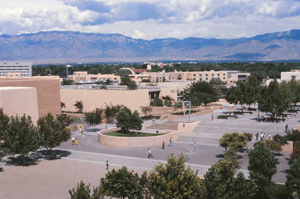 UNM has one of the largest student and faculty populations of Hispanics and Native Americans in the country. Additionally, the university’s main campus is known for its Pueblo Revival style architecture and award-winning landscape designs. "Ash Mall, looking down from Ortega Hall, on the University of New Mexico Campus, circa 1970," photograph, Department of Facility Planning Records (acc 028 058 007).